Question: What are the best used motorcycles under $2000? When I first started riding, I was on the lookout for inexpensive bikes. I wanted something sporty and fun. But, I could not afford a lot of money. Despite being cash-strapped, I still found a good, older bike, which required a little work and money to fix. The key is finding a bike that needs little work and still keeps you under budget. Bring a knowledgeable rider and/or mechanic when looking at used motorcycles. Don’t get discouraged when you find that most bikes are beat to hell or in need of work. The Ninja 250 is the seminal road starter-bike, with good reason. It has enough power for a newer rider but won’t break the rear tire loose if you crack the throttle wide-open in a corner. It is a forgiving bike to learn the ropes on. They are abundant and best bought during the fall or winter. The reason: The owner is looking to upgrade to a quicker, sportier bike for the new riding season. Most folks only ride them a season or two before upgrading. The Ninja 500 is the 250cc’s bigger brother. Although easy to tame, this 500cc motorcycle offers enough power to quench an intermediate rider’s thirst. Despite being a standard motorcycle, the Ninja 250 and 500 look more like a sport bike. The Nighthawk / CB-series is Honda’s standard motorcycle. It has come in different engine sizes — from 250cc through 750cc. Like any Honda, it will run forever with basic maintenance. Case in point: When I was a teenager, I rode an early ’70s CB350 in the fields and light trails around our house. The bike was more than 20 years old when I got it. It required a carb clean, fresh fuel, and tires to replace the dry-rotten ones. It ran really well — despite its neglect and my abuse. 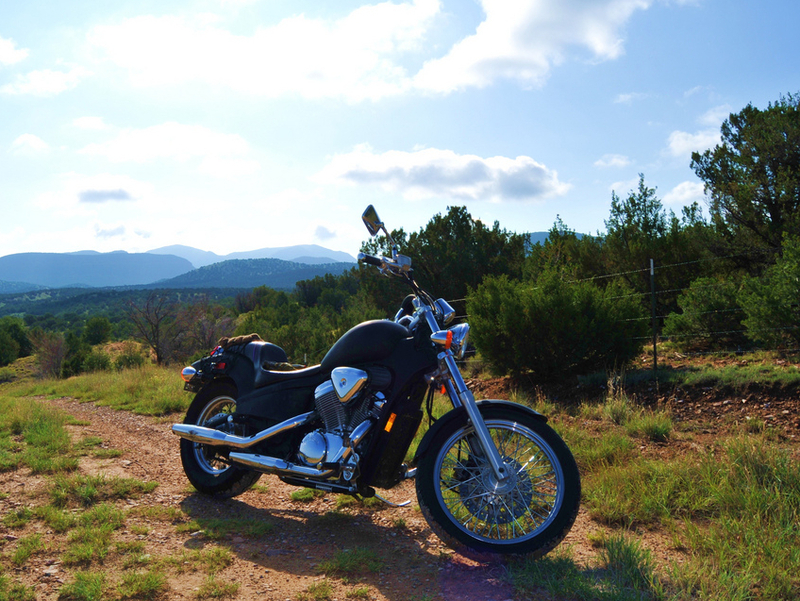 Similar to the CB-series, the Honda Shadow comes in different engine classes — from 500cc to 1100cc. The Shadow, though, is a cruiser motorcycle. It is a great-starter bike for short people. The 1100cc version may be a bit much bike for the beginning rider looking for a bike under $2,000. However, the Honda American Classic Edition (ACE) 1100 can be had for a good deal if you are an experienced rider. For the money, a Suzuki SV650 is one of my favorites. It feels like a sporty bike, with good, sticky tires. The motor has pep and enough low-end torque to pull out of the twisties without bouncing off the rev limiter. Why start on a small displacement motorcycle? The temptation is great, to skip the “Starter” bikes and immediately advance yourself to something beefier, with more street cred — like a super sport motorcycle. Acceleration: Just about any motorcycle will go fast enough to turn you into road rash if you push it – motorcycle engines are just that powerful, and motorcycles are just that light. But acceleration is the real key here – it takes years of experience to be able to project how a bike is going to respond at higher torque levels. A smaller motorcycle — whether a Shadow 250 or a Ninja 500 — will give you a nice, linear acceleration curve, giving you plenty of time to respond to changing road conditions. A more powerful bike can throw you into harm’s way before you are prepared to react, which could mean you’ll be on the hunt for another bike below $2,000. Weight: Let’s face facts: while you are still learning to ride, you are going to lay your bike down. More than once. Recovery from a spilled Harley Street 1200 Custom is going to involve lifting 587 pounds – a pretty substantial burden for anyone to manage. Getting a Honda Rebel 250 back into the upright position requires managing a weight of 331 pounds – much more manageable for just about any rider. While you are learning to handle your new motorcycle, a 250cc is going to be much more forgiving – not only when you suffer from a spill, but also when cornering, when parking, and when storing the bike. Don’t start at the heavy end of the scale. Insurance: Like many other high-ticket items in this world, motorcycles require insurance. Insurance costs for motorcycles factor in many things, including price, safety features, engine power, and age. Just hazard a guess which costs more to insure – a new Ninja 300, or its big brother, the Ninja ZX-6R? Precisely. The larger, faster, and more potentially dangerous ZX-6R has premiums that are much higher than the new rider-friendly 300. Take the money you save on those premiums and invest them in a full set of riding gear instead or put it towards buying a motorcycle for $3,000 dollars. Customization and Repair Cost: Economics is a pretty simple discipline, even where it pertains to motorcycles. The more expensive the motorcycle, the fewer people will be in a financial position to buy it. The fewer bikes that are on the road, fewer manufacturers are motivated to produce quality parts for repairs and upgrades, whether the original manufacturer or aftermarket suppliers. Maintenance also is a huge issue for motorcycles, and more bikes on the road will equal more qualified shops to care for them. Do yourself a favor and start with something that is easy and relatively inexpensive to customize to your exact desires, rather than purchasing a “boutique bike” that can only be modified or repaired by heading back to the dealership. I hope this answer the question: What are the best used motorcycles under $2000?